Incense sticks are burnt at a Chinese Buddhist place of worship. Incense is a material composed of aromatic organic materials that release fragrant smoke when burned. The term incense refers to the substance itself, rather than to the scent that it produces. Incense has been used since antiquity in different parts of the world for religious, practical, and aesthetic purposes. All of the major religions incorporate the burning of incense in their rites to some degree, often as a form of purification or as an offering to a deity. Incense is also used to mask unpleasant odors at funerary rites or in crowded gathering places. The fragrance of incense can be, like fine cuisine for the palate, an indulgence for the sense of smell. In the Japanese incense ceremony (香道 kōdō), precious raw incense materials such as agarwood are appreciated in a formalized setting. Incense is available in various forms and degrees of processing. Depending on how it is used, incense can be categorized as direct burning or indirect burning. Preference for one form or another varies with culture, tradition, and personal taste. Direct burning incense burns by itself without the continued application of heat or flame from an outside source, and must be carefully formulated. Indirect burning incense is simply a combination of aromatic ingredients that is burned on top of a heat source. Incense is usually composed of aromatic materials combined with a combustible binder. Many types of fragrant woods, resins, herbs, and essential oils are used as incense, individually or in combination. Incense is a material composed of aromatic organic materials that release a fragrant smoke when burned. The term incense refers to the substance itself, rather than to the scent that it produces. Many religious ceremonies and spiritual purifying rites employ incense, a practice that continues to this day. Incense is also used in medicine and for its aesthetic value. The forms of incense have changed with advances in technology, differences in underlying culture, and an expansion of reasons to burn it. Incense is available in various forms and degrees of processing. Depending on how it is used, incense can be categorized as direct burning or indirect burning. Preference for one form or another varies with culture, tradition, and personal taste. Coil: Shaped into a coil, the incense is able to burn for an extended period, from hours to days. Cone: Incense in this form burns relatively fast. Cone incenses containing mugwort are used in traditional Chinese medicine for moxibustion treatment. Cored stick: This form of stick incense has a supporting core of bamboo. Higher quality varieties of this form have fragrant sandalwood cores. The core is coated with a thick layer of incense material that burns away with the core. This type of incense is commonly produced by the Indians and the Chinese. When used for worship in Chinese folk religion, cored incensed sticks are sometimes known as Joss sticks. Solid stick: This stick incense has no supporting core and is completely made of incense material. Easily broken into pieces, it allows the user to determine the specific amount of incense he or she wishes to burn. This is the most commonly produced form of incense in Japan. Direct burning incense is produced by either extrusion, pressing into forms, or coating onto a supporting material. To produce extruded or pressed incense, small quantities of water are combined with the fragrance and incense base mixture, and kneaded into a hard dough. The incense dough is then pressed into shaped molds to create cone and smaller coiled incense, or forced through a hydraulic press for solid stick incense. The formed incense is then trimmed and slowly dried. Incense produced in this fashion has a tendency to warp or become misshapen when improperly dried, and must be placed in a climate-controlled environment and rotated several times through the drying process. Coating is used mainly to produce cored incense of either larger coil (up to 1 meter in diameter) or cored stick forms. The supporting material, made of either of thin bamboo or wood, is soaked in water or a thin water/glue mixture for a short time. The sticks are evenly separated, then dipped into a tray of damp incense powder, consisting of fragrance materials and a plant based binder, usually makko （抹香・末香）. Three to four layers of damp powder are coated onto the sticks, forming a 2 mm thick layer of incense material on the stick. 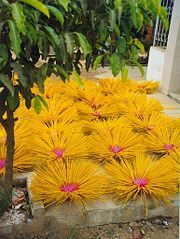 The coated incense is then allowed to dry in open air. Additional coatings of incense mixture can be applied successively after each period of drying. The incense sticks burned in Chinese folk religion temples can have a thickness between 1 to 2 cm. Incense base can also be formed into incense shapes without the addition of any fragrance material. These are purchased by hobbyists who immerse the preformed incense base in their own blends of essential oil mixtures to create their own direct-burning incense. Indirect burning incense, also called non-combustible incense, is simply a combination of aromatic ingredients that are not prepared in any particular way or encouraged into any particular form, making them mostly unsuitable for direct combustion. This type of incense requires a separate heat source, since it does not generally kindle a fire capable of burning itself, and may not ignite at all under normal conditions. The texture of the material in this incense affects the length of time for which it burns; finer ingredients tend to burn more rapidly, while coarsely ground or whole chunks may be consumed very gradually because they have less total surface area. The heat is traditionally provided by charcoal or glowing embers. The incense is burned by placing it directly on top of the heat source or on a hot metal plate in the censer or thurible. The best known incense materials of this type, at least in the West, are frankincense and myrrh, which are mentioned numerous times in the Christian Bible. In fact, the word for "frankincense" in many European languages also alludes to any form of incense. Powdered or granulated: The incense material is broken down into finer pieces. This incense burns quickly and provides a short period of intense fragrance. Paste: The powdered or granulated incense material is mixed with a sticky and incombustible binder, such as dried fruit, honey, or a soft resin, and then formed into balls or small cakes. These may then be allowed to mature in a controlled environment where the fragrances can commingle. Much Arabian incense, also called Bukhoor or Bakhoor, is of this type, and Japan has a history of producing kneaded incense using this method. The composition of incense for direct burning requires more exactitude; it must be carefully proportioned and blended so that it will burn slowly and evenly in its entirety. While indirect burning incense consists mainly of fragrant materials and need not adhere to any specific proportion, recipes and mixes for all direct burning incense must include and balance fragrant materials with a combustible base. The fragrant materials provide the aroma and produce the fragrant smoke when incense is burned. Many types of fragrant woods, resins, herbs, and essential oils are used as incense, individually or in combination. Many of the same fragrant materials are the same as those commonly used in perfume formulations. The following fragrance materials can be employed in either direct or indirect burning incense. They are commonly used in religious ceremonies, and many of them are considered to be quite valuable. Essential oils or other extractions from these materials may also be isolated and used to make incense. The resulting incense is sometimes considered to lack the aromatic complexity or authenticity of incense made from raw materials that have not been infused or fortified with extracts. The following fragrances are only a few of the many that can be utilized as essential oils. Incense deriving its aroma primarily from essential oils is usually cheaper than that made from unextracted raw materials. Fuel and oxidizer mixtures: Charcoal or wood powder forms the fuel for the combustion. Gums such as Gum Arabic or Gum Tragacanth are used to bind the mixture together, while an oxidizer such as Sodium nitrate or Potassium nitrate sustains the burning of the incense. 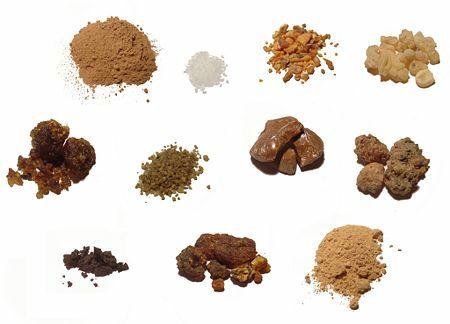 Fragrant materials are combined with the base prior to formation in the case of powdered incense materials, or infused after formation in the case of essential oils. The formula for the charcoal-based incense is superficially similar to black powder, though it lacks the sulfur. Natural plant-based binders: Mucilaginous material, which can be derived from many botanical sources, is mixed with fragrant materials and water. The mucilage from the wet binding powder holds the fragrant material together while the cellulose in the powder combusts to form a stable ember when lit. The dry binding powder usually comprises about 10% of the dry weight in the finished incense. Makko （抹香・末香 incense powder）, made from the bark of the tabu-no-ki tree (Machilus thunbergii) (jap. 椨の木; たぶのき), is perhaps the best known source of natural plant-based binder. Oil content: Resinous materials such as Myrrh and Frankincense must not exceed the amount of dry materials in the mixture to such a degree that the incense will not smolder and burn. The higher the oil content relative to the dry mass, the less likely the mixture is to burn effectively. Oxidizer : The amount of chemical oxidizer in gum bound incense must be carefully proportioned. Too little, and the incense will not ignite, too much, and the incense will burn too quickly and not produce fragrant smoke. Mixture density: Incense mixture made with natural binders must not be combined with too much water in mixing, or over-compressed while being formed. This either results in uneven air distribution or undesirable density in the mixture, which causes the incense to burn unevenly, too slowly, or too quickly. The incense trade flourished from South Arabia to the Mediterranean between roughly the third century B.C.E. to the second century C.E. The Incense Route or the Incense Road was a series of major ancient trading routes stretching across Egypt to India through Arabia which served as a channel for trading goods such as Arabian frankincense and myrrh; Indian spices, ebony, silk and fine textiles; and East African rare woods, feathers, animal skins, and gold.. Egyptian frescoes dating to 1500 B.C.E. depict incense trees being loaded onto a ship.The trade in frankincense, myrrh, and precious woods was one of the most important trading activities of the ancient and medieval world and fueled the growth of many economies. Political upheaval and a general economic decline gradually closed down the Incense Road in the third century, and it was later replaced by other trade routes. 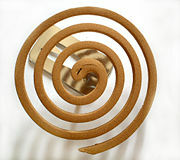 Coil-shaped incense is often used in China, India, and Japan as mosquito-repellent. Incense fragrances can be of such great strength that they obscure other, less desirable odors. This led to the use of incense in funerary ceremonies, because the incense could smother the scent of decay. Another example of this use, as well as of religious use, is the Botafumeiro, a large metal censer weighing eighty kilograms which is suspended from the ceiling of the Cathedral of Santiago de Compostela, which, according to tradition, was installed to hide the scent of the many tired, unwashed pilgrims huddled together. The regular burning of direct combustion incense has been used for chronological measurement through the use of incense clocks. These devices can range from a simple trail of incense material calibrated to burn in a specific time period, to elaborate and ornate instruments with bells or gongs that are designed to involve and captivate several of the senses. Incense made from materials such as citronella can repel mosquitoes and other aggravating, distracting, or pestilential insects. This use has been deployed in concert with religious uses by Zen Buddhists who claim that the incense is part of their meditative practice and is designed to keep bothersome insects from distracting the practitioner. Incense can be like art for the eyes, music for the ears, or fine cuisine for the palate, an indulgence for the sense of smell. Many people burn incense to appreciate its smell, without assigning any other specific significance to it, in the same way that the forgoing items can be produced or consumed solely for the contemplation or enjoyment of the refined sensory experience. This use is perhaps best exemplified in the Japanese incense ceremony (香道 kōdō), where (frequently costly) raw incense materials such as agarwood are appreciated in a formalized setting. Incense can also be used as a form of aroma-therapy, with certain fragrances intended to evoke specific emotions such as confidence, calmness, and relaxation. Incense being burnt during Benediction of the Blessed Sacrament. Religious uses of incense have their origins in antiquity. Incense is used by many religions in various connotations, such as purification rites or as a form of sacrificial offering to a deity. Incense burning is a common Chinese religious ritual in Chinese ancestor worship, Taoism and Buddhism. Incense smoke wafts from huge burners in Lhasa, Tibet. Incense use in religious rituals was first widely developed in China, and eventually transmitted to Korea, Japan, and Vietnam. Incense plays an important role in East Asian Buddhist ceremonies and rites as well as in those of Chinese Taoist and Japanese Shinto shrines. It is reputed to be a method of purifying the surroundings and bringing forth the Buddhist Alamkaraka (Realm of Adornment). In Chinese Taoist and Buddhist temples, the inner spaces are scented with thick coiled incense, which are either hung from the ceiling or on special stands. Worshipers at the temples light and burn sticks of incense in large bundles, which they wave while bowing to the statues or plaques of a deity or an ancestor. Individual sticks of incense are then vertically placed into individual censers located in front of the statues or plaques either singularly or in threes, depending on the status of the deity or the feelings of the individual. In Japanese Shinto shrines and Buddhist temples, the sticks of incense are placed horizontally into censers on top of the ash since the sticks used normally lack a supporting core that does not burn. The formulas and scents of the incense sticks used in temples throughout Asia can vary widely. The Catholic tradition employs incense in worship, contained within a thurible. 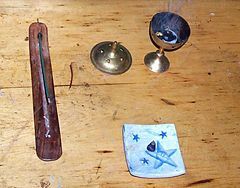 Incense has been employed in the worship of the vast majority of Christian groups since antiquity, particularly in the Roman Catholic and Eastern Orthodox Churches, but also in Anglican and Lutheran Churches. Incense may be used in Christian worship at the celebration of the Eucharist, and at solemn celebrations of the Divine Office, in particular at Solemn Vespers. A thurible, a type of censer, is used to contain incense as it is burned. A server called a thurifer, sometimes assisted by a "boat bearer", approach the person conducting the service with a thurible with burning charcoals. Incense is taken from what is called a "boat," and usually blessed with a prayer. The thurible is then closed and taken by its chain and swung towards the person or item being incensed. Hinduism was probably the first religion in which incense was used and sacrificed to show loyalty to God. The use of incense is a traditional and ubiquitous practice in almost all pujas, prayers, and other forms of worship. As part of the daily ritual worship within the Hindu tradition of India, incense is offered to God in His deity forms, such as Krishna and Rama. This practice is still commonplace throughout modern-day India. It is said in the Bhagavad-Gita that, "Krishna accepts the offering made to Him with love," and it is on this principle that articles are offered each day by temple priests or by those with an altar in their homes. In Islam it is a common practice to use incense for meditation, especially in the Sufi sect of Islam. A common ritual, especially for Indian and Pakistani Muslims, is to burn the incense every Thursday after sunset. Incense is prescribed in the Bible for use in the Temple. Modern Judaism does not have a ritual use for incense (without the minor exception of havdala). It was known to Jews in ancient times that a compound of aromatic gums and balsams will burn slowly, giving off a fragrant aroma. The Hebrew words qeto'reth and qetoh•rah' are from the root qa•tar', meaning "make sacrificial smoke." The equivalent in the Christian Greek Scriptures is thy•mi'a•ma. The sacred incense prescribed for use in the wilderness Tabernacle was made of costly materials that the congregation contributed (Exodus 25:1, 2, 6; 35:4, 5, 8, 27-29). In giving the divine formula for this mixture, God said to Moses, "Take to yourself perfumes: stacte drops and onycha and perfumed galbanum and pure frankincense. There should be the same portion of each. And you must make it into an incense, a spice mixture, the work of an ointment maker, salted, pure, something holy. And you must pound some of it into fine powder and put some of it before the Testimony in the tent of meeting, where I shall present myself to you. It should be most holy to you people." Then, to impress upon them the exclusiveness and holiness of the incense, God added, "Whoever makes any [frankincense] to enjoy its smell must be cut off from his people" (Ex 30:34-38; 37:29). At the end of the Holy compartment of the tabernacle, next to the curtain dividing it off from the Most Holy, was located "the altar of incense" (Exodus 30:1; 37:25; 40:5, 26, 27). There was also a similar incense altar at Solomon's temple in Jerusalem (1 Chronicles 28:18 and 2 Chronicles 2:4). Every morning and evening the sacred incense was burned (Ex 30:7, 8; 2Ch 13:11). Once a year on the Day of Atonement, coals from the altar were taken in a censer, or fire holder, together with two handfuls of incense into the Most Holy, where the incense was made to smoke before the mercy seat of the ark of the testimony (Le 16:12, 13). Indian incense can be divided into two categories: masala and charcoal. Masala incenses are made of dry ingredients, while charcoal incenses contain liquid scents. Masala incenses have several subgroups. Masālā is a word in Hindi (and other Indian languages) meaning "spice mixture." It is commonly used when referring to curries or other food dishes. Masala incenses are made by blending several solid scented ingredients into a paste and then rolling that paste onto a bamboo core stick. These incenses usually contain little or no liquid scent (which can evaporate or diminish over time). Dubars are a sub-group of masala incense. They often contain ingredients entirely unfamiliar in the West and contain very complex scents. They are usually very slow-burning and are quite sweet and spicy in scent. They contain both solid and liquid perfumes in a binder which never quite dries out, making the incense sticks soft to the touch. Champas are a sub-group of durbars. They contain a natural ingredient indigenous to India called "halmaddi." Halmaddi is a grey semi-liquid resin taken from the Ailanthus Malabarica tree. It smells like the flowers of the plumeria tree. Plumeria flowers are known as champa flowers in India, hence the name of the incense group. Halmaddi is hygroscopic which means it absorbs moisture from the air. This can cause champa incenses to have a wet feeling to them. Nag Champa is probably the most famous incense of the champa group. Charcoal incenses are made by dipping an unscented "blank" (non-perfume stick) into a mixture of perfumes and/or essential oils. These blanks usually contain a binding resin (sometimes sandalwood) that holds the sticks' ingredients together. Most charcoal incenses are black in color. Tibetan incense refers to a common style of incense found in Tibet, Nepal, and Bhutan. These incenses have a characteristic "earthy" scent to them. Ingredients vary from the familiar such as cinnamon, clove, and juniper, to the unfamiliar such as kusum flower, ashvagandha, or sahi jeera. Agarwood （沈香　Jinkō） and Sandalwood （白檀　Byakudan） are the two most important ingredients in Japanese incense. Agarwood is known as "Jinkō" in Japan, which translates as "incense that sinks in water," due to the weight of the resin in the wood. Sandalwood is one of the most calming incense ingredients and lends itself well to meditation. The most valued Sandalwood comes from Mysore in the state of Karnataka in India. Another important ingredient in Japanese incense is kyara （伽羅）, a specific kind of agarwood which is currently worth more than its weight in gold. (Japanese incense companies divide agarwood into six categories depending on the region obtained and properties of the agarwood). 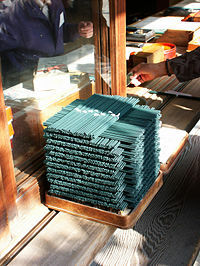 Nippon Kodō （日本香堂） is the largest seller of Japanese incense in Japan. Most of their incense is "Everyday" quality (毎日 mainichi), but the make some "Traditional" incense as well. Shōeidō（松栄堂） and Baieidō （梅栄堂）, two of the oldest incense makers in Japan, sell many of their Traditional incenses overseas. Kyūkyodō （鳩居堂）, Kunmeidō （薫明堂）, and Kōkandō （孔官堂） also sell some incense overseas. Incense smoke contains various contaminants and when burned in poorly ventilated areas may pose health threats, particularly cancer, to those who spend significant time there. Research carried out in 2001 in Taiwan linked the burning of incense sticks to the slow accumulation of potential carcinogens in a poorly ventilated environment by measuring the levels of polycyclic aromatic hydrocarbons (including benzopyrene) inside Buddhist temples. The scientists conducting the study noted that "Sometimes the visibility is so low you can't see clearly across the room. We are concerned for the health of workers or keepers in the temples." Other research has found no correlation between exposure to incense and respiratory health problems. One such study in Hong Kong, where previous studies had found incense burning to be the major source of airborne carcinogens in the home, revealed no connection between incense burning and respiratory health problems. Surprisingly, they found that "Incense burning did not affect lung cancer risk among non-smokers, but it significantly reduced risk among smokers, even after adjusting for lifetime smoking amount." However, they qualified their findings by noting that incense burning was associated with low-cancer-risk dietary habits, which may have contributed to the result. Burning incense containing Boswellia resin, found in frankincense, has been shown to affect sensation and emotional states in a positive way. The incensole acetate (IA) activated the Transient receptor potential vanilloid (TRPV)3, an ion channel implicated in the perception of warmth in the skin, and elicited anxiety-reduction and anti-depressive-like behavioral effects in mice. ↑ 1.0 1.1 Incense Route - Desert Cities in the Negev (HTML). UNESCO. Retrieved December 16, 2007. ↑ 2.0 2.1 Traders of the Gold and Incense Road (HTML). Message of the Republic of Yemen, Berlin. Retrieved December 16, 2007. ↑ Himanshu Prabha Ray, The Archaeology of Seafaring in Ancient South Asia (Cambridge University Press, 2003, ISBN 0521011094), 31. ↑ Incense. Catholic Encyclopedia. Retrieved December 16, 2007. ↑ J.M. Lin and L.H. Wang, "Gaseous aliphatic aldehydes in Chinese incense smoke," Bulletin of Environmental Contamination and Toxicology 53(3) (1994):374-81. ↑ Clodagh O'Brien, Incense burning releases cancer-causing chemicals. New Scientist (August 2001). Retrieved December 16, 2007. ↑ 7.0 7.1 Linda C. Koo, J.H-C. Ho, Suketami Tominaga, Hidetsuru Matsushita, Hideaki Matsuki, Hiroyuki Shimizu, and Toru Mori, "Is Chinese Incense Smoke Hazardous to Respiratory Health? : Epidemiological Results from Hong Kong," Indoor and Built Environment 4(6) (1995):334. ↑ A. Moussaieff, N. Rimmerman, T. Bregman, et al., "Incensole acetate, an incense component, elicits psychoactivity by activating TRPV3 channels in the brain,", FASEB Journal 22(8) (2008): 3024–3034. Retrieved May 7, 2011. This page was last modified on 28 February 2018, at 19:38.